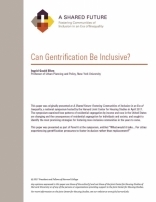 A SHARED FUTURE: CAN GENTRIFICATION BE INCLUSIVE? While gentrification raises fears of displacement, it also offers some hope because the growth in higher-income households in previously poor areas can help to shore up city tax bases and possibly spur economic and racial integration. However, absent policy intervention, that integration may be only fleeting because, left to its own devices, the market is unlikely to deliver on the promise of long-term integration. After reviewing some of the literature on gentrification, the author discusses three promising strategies. The first is to preserve existing affordable housing units in changing neighborhoods by investing in public housing, extending affordability restrictions on privately-owned units. The second is to expand the stock of long-term affordable units by making more strategic use of publicly-owned land as well as tools like inclusionary zoning. The third is to work with local community groups to help ensure that low- and moderate-income residents can benefit from the expanded economic, educational, and social opportunities present in gentrifying neighborhoods.